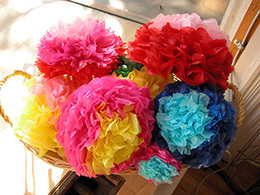 Make a bunch and put them in a vase to brighten up your room, or give them to a friend to brighten up their day! Select 4-6 pieces of colorful tissue paper and have an adult help you cut them out to the same size. Fold your stack of tissue paper in half. Continue to fold your tissue paper stack back and forth like an accordion. Bend your pipe cleaner over the center of the stack twisting the short end around the long end to fasten. This is your stem! Carefully fan out your folded tissue papers on each side of the stem. Gently separate the layers of tissue starting from the top. These are your flower petals! Add an additional pipe cleaner to strengthen the stem and curl the ends to make your flower look like it came right from the garden! To view and download the original craft project PDF click here!